There are several reasons of hair falling like stress, excessive use of chemicals, diseases, hormonal changes, age, heredity, among many other causes but one of them, is that of a poor diet. A structural part of the hair is composed of proteins. Therefore, feeding of essential nutrients like vitamins and minerals is vital, not only to prevent hair loss, but also for the hair to look healthy, shiny and beautiful. Some people spend a lot of money on hair care products to solve the problem of hair fall. But the best way to prevent hair loss or improve their appearance is to keep a close eye on what you’re eating as foods help to prevent hair fall. So read on and find out which foods can help promoting hair growth and solve the problem of hair fall. Vitamin A is found in fish, milk, eggs, butter, liver and dark green vegetables, plus carrots. These foods help to strengthen and stimulate hair growth in a natural way, also help to regenerate tissues of scalp. 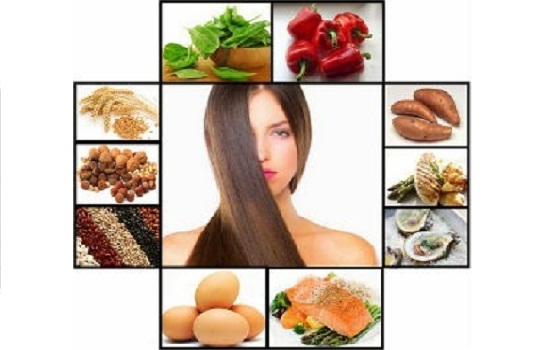 Principally good for dry hair, these foods help to prevent hair fall. Vitamin A also posses antioxidant properties, which also acts against skin aging and control the negative effects of free radicals. It is vital for the production of sebum and preventing problems like dandruff, hair loss or hair dehydration. You need to balance the consumption of this vitamin because its excess can cause the opposite effect. Group B vitamins are found in yeast, egg yolks, whole grains and meat. It is important in the production of hemoglobin that carries oxygen to the body’s cells. If you take these vitamins you ensure that the hair follicles get enough oxygen to stay healthy. Furthermore, the B5 (panthenol) prevents hair fall and prevent loss of hair color. Vitamin B6 is important in preventing hair fall and produces “melanin” the substance that gives color to the hair, found in yeast, liver, vegetables, whole grains. Vitamin B3 (nicotinic acid) stimulates hair growth and increases blood circulation. It is found in yeast, chicken, turkey, fish, meat and wheat germ. Biotin, also called vitamin B8, is necessary for the action of certain enzymes essential for cell replication processes, therefore it is used for cell growth. Without it absorption is not easy on the skin and scalp, its deficiency is a major cause of baldness. It also participates in the production of keratin (cares the color and brightness of the hair) that prevents hair fall. Group C vitamins are found in citrus, red peppers, mango, strawberries, kiwi, cantaloupe, pineapple and green vegetables; these foods help to prevent hair fall. Vitamin C is the main nutrient for the production of collagen, an essential part of the hair fiber. Lack of this vitamin can cause the hair to break and get weaken. Therefore intake of these products helps to strengthen hair. Vitamins Group E is found in nuts, eggs, green leafy vegetables like spinach and broccoli, soy, in Brussels sprouts, vegetable oil and wheat germ. This foods help to prevent hair fall. It promotes the immune system, increases the capacity of renewal and hair growth, is responsible for the blood supply to the scalp and helps in absorption of oxygen. Vitamins Group H (biotin). It’s found in yeast, rice, oats, corn, barley, soy and milk. It’s involved in the production of keratin hair helps to control the generation of scalp’s fats, prevents it from drying and break out, also gives greater elasticity to the hair. Minerals are essential for healthy and well nourished hair. Zinc is essential for hair growth, stimulates cell reproduction and repairs hair tissue. It is very essential for those who have hair with a dull texture. It is found in seafood, eggs, oysters, yeast, wheat germ, fish and meats, these foods help to prevent hair fall. Magnesium helps in the metabolic processes, involves in active enzymatic reactions. It’s found in almonds, bananas, wheat, chestnuts, dates and spinach. Sulfur is important to strengthen weak and brittle hair. Promotes the synthesis of keratin and collagen. It’s found in white meat, liver, egg, almonds also in vegetables and fruits. Iron is found in red meat, spinach and vegetables and is important for oxygenation of the scalp and hair pigmentation. Copper is essential for the synthesis of melanin, this mineral is found in seafood, spinach and nuts. Selenium helps fight free radicals. It’s found in fish. Minerals guarantee the excellence and strength of the hair. They are found in spinach, cereals, wholemeal bread and nuts. Do not forget that one of the first things you should do when you suffer from hair fall, excessive damage or slow growth, is to change your diet including therein the above-named foods. Remember also drink plenty of water.